SAN FRANCISCO, CA--(Marketwire - October 3, 2007) - Imagine Sports®, Inc., a leading sports simulation game developer, today announced first round predictions for Major League Baseball's American League Divisional Series. Employing their state-of-the-art Diamond Mind simulation engine, Imagine Sports ran each game of the ALDS 1,000 times to ensure the most accurate results possible. In their predictions, The Yankees win 572 of 1000 series against the Indians. The Indians' weak spots have been identified as the Indians' right-handed starters, Jake Westwood (5.06 ERA) and Paul Byrd (6.75 ERA). On a per game basis, over the 1000 series the Red Sox averaged 4.36 runs and the Angels 3.94 per game. Stay tuned for tomorrow's NLDS predictions and daily updates. For more detailed data on these predictions or to request day by day updates on the statistics, please contact Michael Parlapiano at Kohnke Communications. 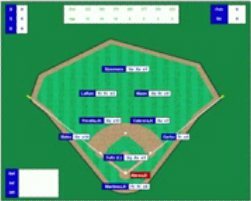 Diamond Mind utilizes an advanced, highly accurate simulation engine that has been developed and refined over the course of 20 years by renowned baseball statistician, Tom Tippett. The engine is so advanced that it has been used by ESPN to conduct simulations throughout the MLB season. Editor's Note: Projections and ratings for each player were updated based on their regular season performances, and while playoff rosters have not yet been finalized, Imagine Sports used their best judgment in selecting each team's starting rotations, batting orders, bullpen and bench roles. All lineup selections take into account players carrying an injury into the postseason, however Imagine Sports did not attempt to simulate the degree to which such an injury might hamper the player, except to the extent that it already was reflected in his regular season performance. Kohnke Communications for Imagine Sports, Inc.
Simulations of 9th in Game 1 between the New York Yankees and the Cleveland Indians.